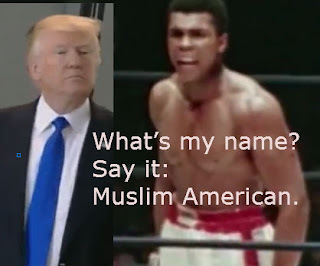 Muhammad Ali may be the most famous American athlete ever. His life is the subject of books, documentaries and feature films. But our guest, writer Jonathan Eig, says he was surprised to discover no one had ever done a complete, unauthorized biography. Eig spent four years researching Ali’s life, speaking with his three surviving wives, his managers and hundreds of others. Here are some basic facts that readers (and listeners) ought to remember. First, Muhammad Ali passed away on June 3rd 2016–just two ago. Second, the book “Ali: A Life” was published October 3, 2017. Third, the author claims that he spend four years researching his subject matter, Ali. This means that work on the book must have concluded sometime late 2016 or early 2017 to allow for the technical review and production of the manuscript. That would suggest that Mr. Eig was doing his research about Muhammad Ali when Ali was alive. But Ali’s perspectives are absent in this work because the author did not sit down with the subject of his book. The book is filled instead with psychoanalytical statements, hyperboles, assumptions, and baseless interpretations intended to smear a figure towering above even those who hated him. Mr. Eig could not have sat face to face with Ali because Mr. Eig is a coward who would like to profit from telling a fake life story about a giant with the courage and sacrifices that no one can dispute–after his death. Neither Ali nor those who loved Ali claimed that Ali was a saint. To write a book telling the readers just that is most telling about the character of the author and to some extent, NPR staff who gave such an opportunist fame seeker space to delegitimatize a symbol of Black Americans’ struggle for dignity and personhood. 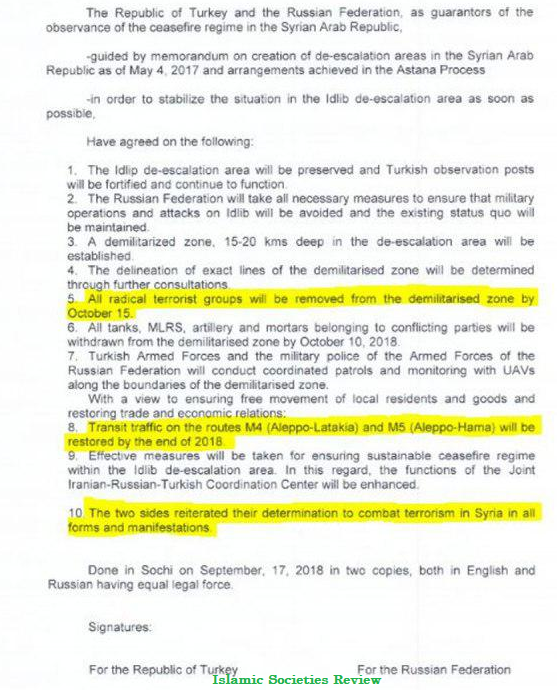 Leaders of Russia and Turkey have agreed to create a demilitarized Idlib buffer zone in Syria’s northwestern province to separate government forces from rebel fighters based there. 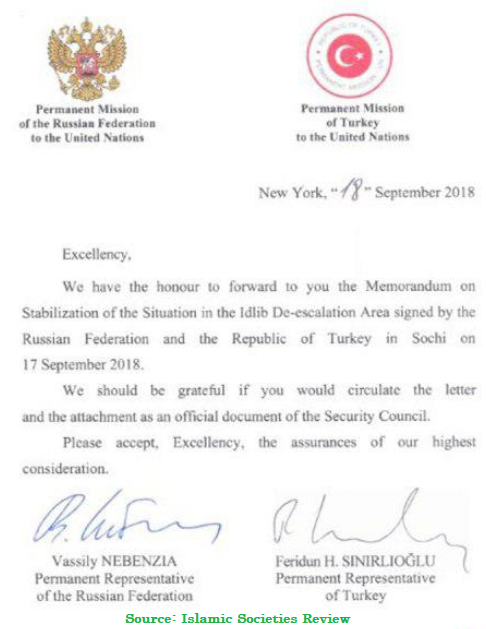 two leaders signed was forwarded to the UNSC are displayed below. With every military operation in areas held by the so-called moderate opposition fighters, Western governments accuse the Syrian government of having planned to use chemical weapons or of having used chemical weapons. In the latter case, they responded by bombing sites and assets that allegedly enabled the government to use such weapons. So has the Syrian government used chemical weapons and if so, why? Western governments explain the Syrian government’s use of chemical weapons this way. The chemical attacks occurred in areas where the Syrian government encountered stiff resistance. 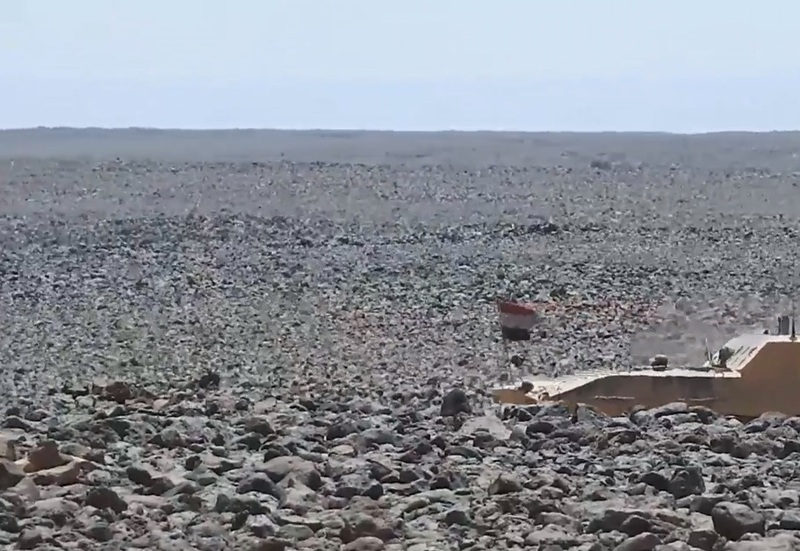 The Syrian government uses weapons of mass destruction to speed up military operations or to force armed groups to surrender. However, based on this reasoning, one would expect the Syrian government to use chemical weapons against the most hardened fighters, again, for speedy victory or to force surrender. Trump’s inclination to invoke superlatives to demean persons he does not like and to praise himself or persons he likes is well documented. Almost all his short and long statements would include some superlatives. His tweet announcing the start of the Iran sanctions is no exception. Logically, if these are “the most biting sanctions ever imposed”, how can they be even more so in November? Logical consistency aside, let’s assume that this round of sanctions is “very biting” and the next round will make them “the most biting” sanctions ever. The stated goal of the administration is to reduce Iran’s energy export (oil and gas) to zero. Of course, reducing the sales of something the Iranian government depends on to zero will be unprecedented, and will deserve the superlative descriptor should it be achieved. However, we already know that that will not happen because three of the top energy buyers, China, India, and Turkey have stated publicly that the sanctions are outside the UNSC and as such they are unilateral, they were imposed in contravention to a deal endorsed by the UNSC and signed by the P5+1, and they encroach on national sovereignty of other nations, and as such these states will not abide by the new and re-instated US sanctions. In other words, they will continue to purchase Iranian oil and natural gas, not to do Iran a favor, but to protect their own national interests. As to sanctions related to other services and products (auto parts, banking, and gold, etc…), that, too, may not achieve the sated goals. In fact, it may backfire. This is very important. Aware that US secondary sanctions (sanctioning companies that deal with Iran) would discourage large companies with complex and large operations in the US from doing business with Iran, EU leaders are willing to offer added incentives to small and midsize companies to do business with and in Iran. This means that smaller companies that do not have no economic ties to the US or have no significant operations and investments in the US would be encouraged (through economic, financial, and legal incentives) to do business in and with Iran. Moreover, the EU leaders also threatened EU companies with sanctions if they abandon deals with Iran. Should these sanctions last longer than the current term of the US president, the EU measure could offer larger companies the loophole they need to evade US sanctions. They could sell their interests and investments in Iran to these companies, or they could spinoff some operational divisions to avoid EU sanctions. Iran does not seem to have any interest in the US market or in US companies. Their priorities is to remain connected to the global market. The EU legal and economic measures such as increasing small companies (and privately held ones) to do business with Iran will allow the latter to remain connected to the global market, which would allow them to focus on their more reliable partners like China, Russia, India, and the Koreas. As Harley-Davidson, Inc. reminded us when it announced it was moving some production out of the US and into the EU to sidestep paying high tariff, large business companies have a responsibility to their shareholders not to politicians. They are, by nature, multi-national. In other words, they will seek profit wherever they can find it and move all or some of their operations to any country that would maximize their profit. 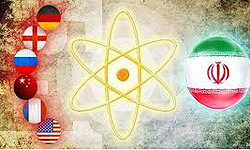 In this particular dispute, it would seem that the world community’s interest in global security (limiting nuclear proliferation) favors upholding the Iranian deal. Given its track record thus far, this administration is motivated, in part, by undoing the legacy of its predecessor. That is not a basis for building and preserving international alliances and credibility. None of the signatories to the deal said that the Iran Deal was perfect, as are all other negotiated multilateral deals. Some Iranian leaders, too, were not happy with some of the terms of the deal. But this US administration is victim of its own quest for superlative goals. That may be a good business strategy. But it is not a practical political strategy. In the end, the all-or-nothing approach to Iran may lead to the only logical result: nothing. Because in politics, the domain of compromise, the quest for superlatives is a liability, not an asset.